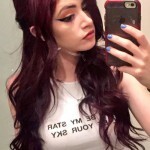 Chrissy Costanza posted a selfie today wearing a Target MTV Tie Dye Muscle Tee (sold out). 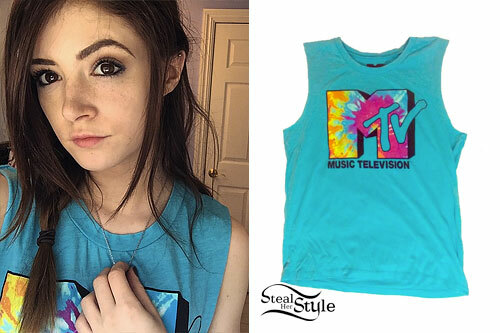 You can buy a men’s t-shirt in the same colors from MTV Shop ($19.99). 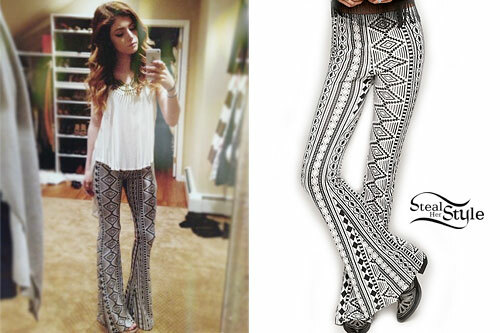 Chrissy Costanza filmed a music video for her band Against The Current’s new single “Dreaming Alone” wearing a Free People Lace Lovers Folk Song Dress ($128.00) — also available at Bloomingdale’s ($88.80) and Macy’s ($104.99) — with shoes like the Topshop MUSKAT Fringe Ankle Boots ($150.00). 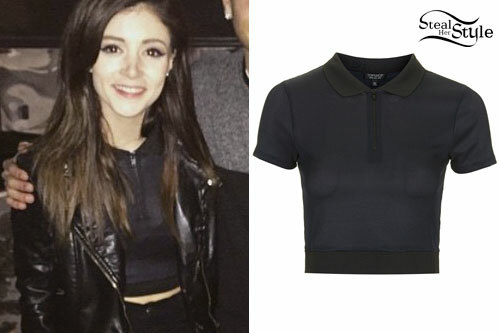 Chrissy Costanza wore the navy blue and black Topshop Knitted Polo Crop Top (£24.00 / $45.00) — also at Nordstrom — on tour with her band Against The Current. 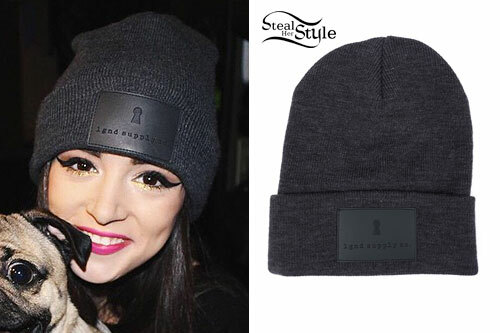 Chrissy Costanza posted an instagram photo today wearing an Adidas Originals Typo Tee in Black (£26.00), joggers like the Betsey Johnson Skinny Stretch Fleece Sweatpant ($39.98), Adidas Originals Women’s Superstar W Casual Athletic Shoes ($66.25 – $80.00) in white black and gold, and a cat face Aritzia Talula iPhone 5/5s Case ($20.00). 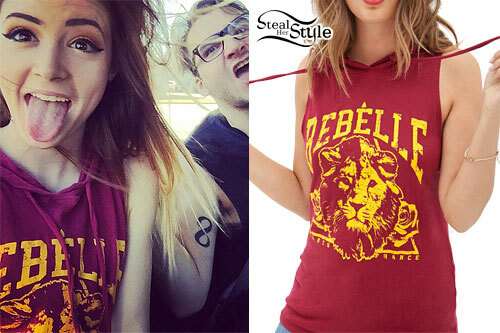 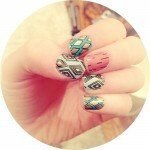 Chrissy Costanza wore a burgundy and gold Forever 21 Hooded Rebélle Graphic Tank ($15.80) in an instagram photo today. 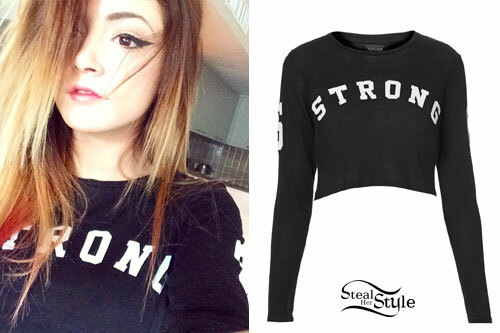 Chrissy Costanza is wearing the Topshop Strong Motif Crop Tee ($32.00), which Ellie Goulding and Jennifer Hudson both own. 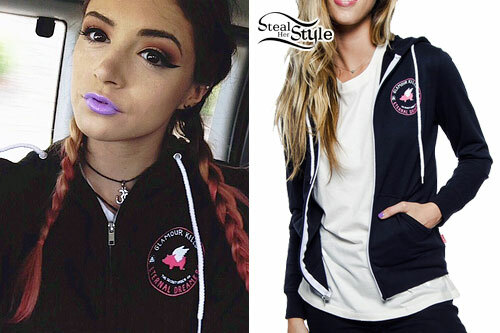 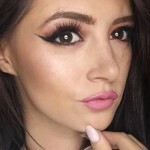 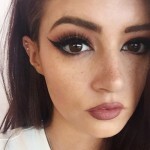 Chrissy Costanza wore a Glamour Kills Skyline Dreamer Zip Hood ($49.99) and a Lime Crime Opaque Lipstick in “Airborn Unicorn” ($18.00) for this instagram photo. 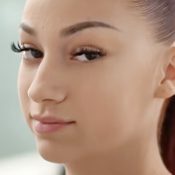 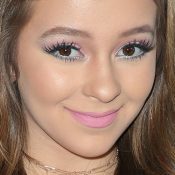 Chrissy Costanza wears a Topshop Bandeau Skort Playsuit ($96.00) on the cover of her band Against The Current’s new EP Infinity.